Today's outfit was a bit of a mixture of old and new and as the day went on, it changed a little. 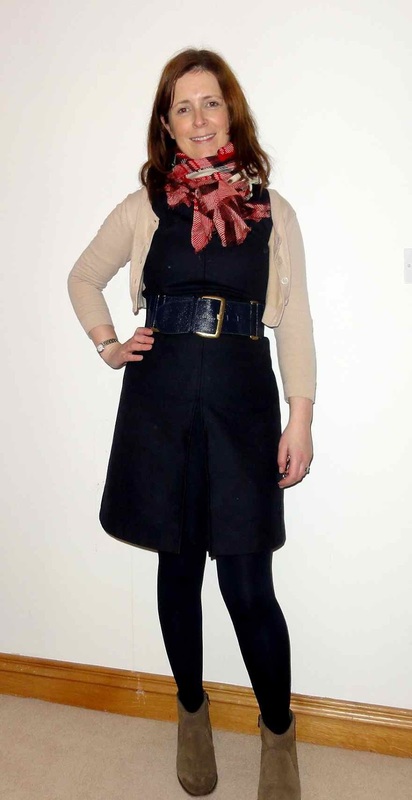 It started out in the charity shop, where I wore this navy wool dress with long leather boots..
You might recognise the scarf from earlier this week. I had been concerned about working with the different colours and patterns but I think it goes well with this dress (last worn here). Later on in the day, I remembered I had a navy belt from Topshop (old) so I added it and I changed into my Mango boots because it stopped raining. I think the tan ankle boots make the dress look less formal. 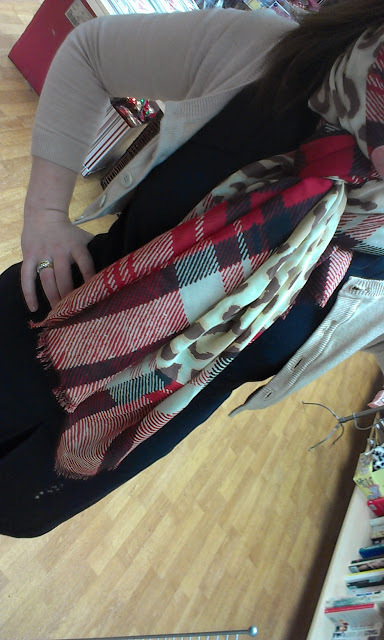 I also took photos showing how the scarf can be worn to show off the red check or the beige/cream animal print. 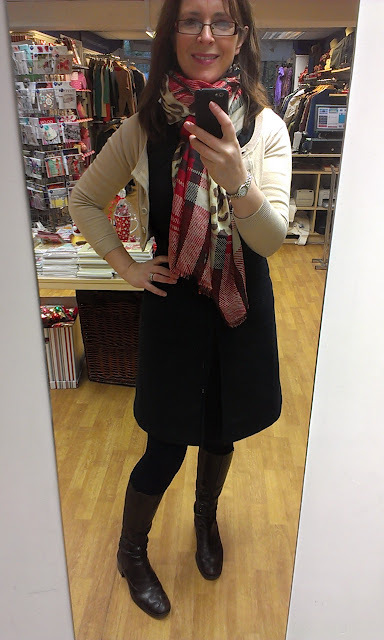 It's actually quite a versatile scarf so I'm pleased with my £7 bargain from M&S. Before I sign off, have you sent me a picture with you wearing something red yet? You can check out all the great entries so far on this link. Some gorgeous outfits, cute kids and fab manicures - thank you if you've already entered! Remember, you have until the 18th January to email me a picture to schoolgatestyle@yahoo.co.uk. It puts you in the draw to win the Radley red handbag pictured at the top of this page! More information on this link. Good luck and thank you for supporting The British Heart Foundation's Rock Up In Red fundraiser! Just had a look at the Rock up in Red link. Some brilliant pics. Fingers crossed I'll be able to send you something tomorrow. I love the scarves on you and how you've worn two together in the first photo. Two scarves in one... Genius! Love the red painted baby and the stunning rings in the first manicure!!! Great Scarf Avril, but in love with your belt! Looking great as always Avril- I do love that scarf! I'm off to have a root through m&S tomorrow- who knows what I might pick up! Ps you do look super slim after Christmas- I'm well jell! Such cute accessories! Love that scarf, and really LOVE those ankle boots! I've really been into ankle boots lately, and you are right, they add a more casual yet chic vibe to outfits! I love that belt hun and i so want those boots!!!! scoping ebay now lol..
A great go to outfit. Love the red gallery.